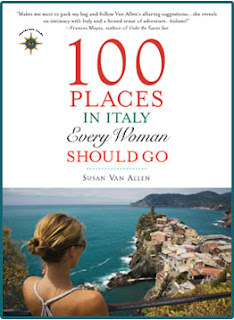 When we think of “How do I love thee, Let me count the ways,” Elizabeth Barrett Browning’s most famous line, it seems only natural that this romantic poet would wind up in Italy. It was amore that brought her to Florence, where she lived for fourteen years with her husband Robert Browning. Stop by their former Oltrarno apartment to get a hit of what life was like for these bohemians back in the nineteenth century. When Barrett met Browning in London, she was thirty-eight and at an all-time low. Her poetry books were a smash, but she was a semi-invalid with lung problems that began with a spinal injury she got as a teenager and left her dependent on opium for the rest of her life. And she was in mourning for her beloved brother. He’d gone with her to a lovely lakeside spot to help restore her health, and ended up drowning in that lake. In swooped poet-on-the-rise Robert Browning, who wrote her a fan letter that began, “I love your verses with all my heart…” It was a little too over the top for Elizabeth, but the two started writing to each other and after a few months Robert showed up at her father’s house, where she was living as a recluse. Robert was six years younger than Elizabeth, a strapping, healthy guy, and it was hard for her to even imagine he could love her. Elizabeth’s wealthy, tyrannical father was dead set against any of his twelve children coupling, but after their first meeting, a secret romance between Elizabeth and Robert began. A year later, in 1846, they eloped, and Robert whisked Elizabeth off to Italy for their honeymoon, along with her nurse and cocker spaniel. Elizabeth described it as “living a dream.” After toodling around, they found this gem of a six-room apartment in Florence. They bargained with the landlord, giving him back the grand furniture the place came with, and getting the rent down to twenty-five guineas a year, which included free entrance to the nearby Boboli Gardens. The apartment is on the piano nobile (what we think of as the second floor) of this fifteenth-century palazzo, once owned by Count Guidi. 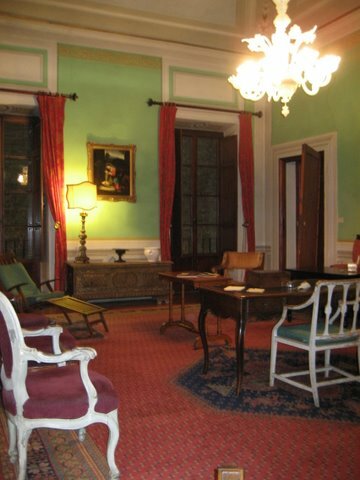 You pass through a big dining room to get to the main attraction: the drawing room where Elizabeth wrote and hung out with artists and writers like the Hawthornes and Harriet Beecher Stowe. Thanks to an oil painting Robert had done, the room looks almost exactly as it was when the Barrett-Brownings lived here. It has a cozy Victorian style, with intense olive green walls, soft lighting, velvet upholstered furniture, and a little table with a mother of pearl tea set. In the middle of it all is a tiny writing desk where you can imagine Elizabeth composing Aurora Leigh—a love story of a woman writer making her way in the world. The gilt-framed mirror over the fireplace is the one piece that’s original to Casa Guidi. Elizabeth wrote to her sister about how thrilled she was Robert bought it, even though to her the five-pound price was an extravagance. Elizabeth got her strength back in Florence. At forty-three she gave birth to a son, whom she nicknamed Pen. She got passionately involved with the Italian fight for independence, and wrote the poem “Casa Guidi Windows” in support of the Florentines she saw from her terrace, who protested fiercely against Austrian occupation. Though most biographies claim “they lived happily after,” Elizabeth and Robert were real people, so it wasn’t a fifteen-year honeymoon. At some points it got a little Madonna-Guy Ritchie-esque. Elizabeth was the poet star of the duo, paying all the bills for the house and many wonderful vacations, with her writing profits and money she’d inherited from an uncle. She got her way when it came to dressing Pen, outfitting him in effeminate velvet get-ups and having his hair grow in long curls like his mommy’s. Robert didn’t stand behind Elizabeth’s passions— feminism, the fight for Italian unification, and most of all her explorations into spirituality, which involved consulting mediums. Add to that her four miscarriages and opium addiction to give some shadings to the “happily ever after” story. A photograph of Elizabeth just months before her death shows her dressed in billowing black silk, with that signature cascade of curls surrounding a face that looks pained and cadaverous. The story goes she died in Robert’s arms in 1861 in Casa Guidi, at the age of fifty-five. Some suspect Robert may have upped the dose of morphine to put an end to her suffering. Monday-Wednesday-Friday, 3-6, April to November. NOTE: The attached rooms of the Barrett-Browning place that aren’t being used for a museum have been turned into a vacation apartment, so you can sleep where the Brownings slept. It’s three bedrooms, three bathrooms, and kitchen (www.landmarktrust.org.uk). English Cemetery: Elizabeth Barrett Browning’s grave, Piazzale Donatello. Golden Day: Visit Casa Guidi, enjoy the Oltrarno. Have dinner at Osteria del Cinghiale Bianco (Borgo San Jacopo 43r, 055 215706, closed Wednesday), set in a thirteenth-century tower, serving robust versions of traditional Florentine dishes. Leave a comment below and enter yourself in the drawing for a copy of Susan's book and some goodies from Italy! Come back every day this week for more chances to win! Grazie for this piece, I'll have to look up the Casa next time we're there! What an informative piece of history! More reasons we must get to Italy and learn it through your eyes, Angela. And, though she was in poor health for so long, and died so young, I'm happy to know that she had a cocker spaniel to give her love and comfort when other areas of life let her down. What a wonderful piece - sounds like quite a place to visit. Thank you for sharing! One of our favorite spots in Florence is on the same piazza - Pontorno's vivid Deposition and Annunciation just inside Santa Felicita - don't miss it! Thank you for the recommendation. I'm returning to Florence for a third time this year (lucky me! ), with some friends who have never been, and it will be nice to be able to take them somewhere a bit off the beaten track. Anne--I love that Annunciation--Mary strikes this Super Model Pose--and those glorious colors!